Line 2 rimmed baking sheets with parchment paper. Roll out each puff pastry sheet on lightly floured surface to 11-inch square. Using 5-inch-diameter cookie cutter or bowl, cut out 4 rounds from each pastry sheet, forming 16 rounds total. Divide 8 pastry rounds between prepared baking sheets; pierce rounds all over with fork. Using 3 1/2-inch-diameter cookie cutter or bowl, cut out smaller rounds from center of remaining 8 rounds (reserve 3 1/2-inch rounds for another use), forming eight 5-inch-diameter rings. Brush outer 1-inch edges of 5-inch rounds on baking sheets with beaten egg; top each with 1 pastry ring. Freeze at least 30 minutes. DO AHEAD: Can be made 1 day ahead. Cover and keep frozen. Do not thaw before continuing. Preheat oven to 375°F. Mix cheese, lemon juice, and salt in bowl; spread mixture inside rings on frozen pastry rounds. Overlap apple slices atop cheese. Mix butter and 1/4 cup honey in small bowl; brush over apples. Sprinkle with allspice. 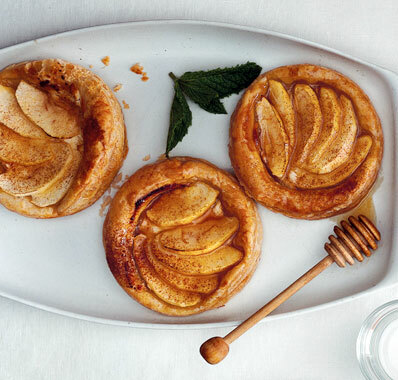 Bake until apples are tender and pastry is golden, about 35 minutes. Place tartlets on plates. Drizzle 1 tablespoon honey over each and serve warm or at room temperature. Bake the tartlets four to six hours ahead, then store them uncovered at room temperature. Rewarm in a 350°F oven for five to ten minutes. Drizzle tartlets with honey just before serving.